It was pretty much last minute decision to go to Paris this year. The Eurostar prices started to accelerate approaching the show and the flights prices weren't too far behind, but then I managed to get an offer by Air France and booked it just a few days before I travelled. This year I decided to save on the hotels and stayed in the Ibis. I don't have much experience staying at Accor hotels, but the one I stayed in Paris wasn't so great. But that's all gone as soon as I landed at Orly airport. The first night I dined with a chocolate friend at Pottoka opened by the chef Sébastien Gravé. It's informal modern French restaurant with reasonable prices. 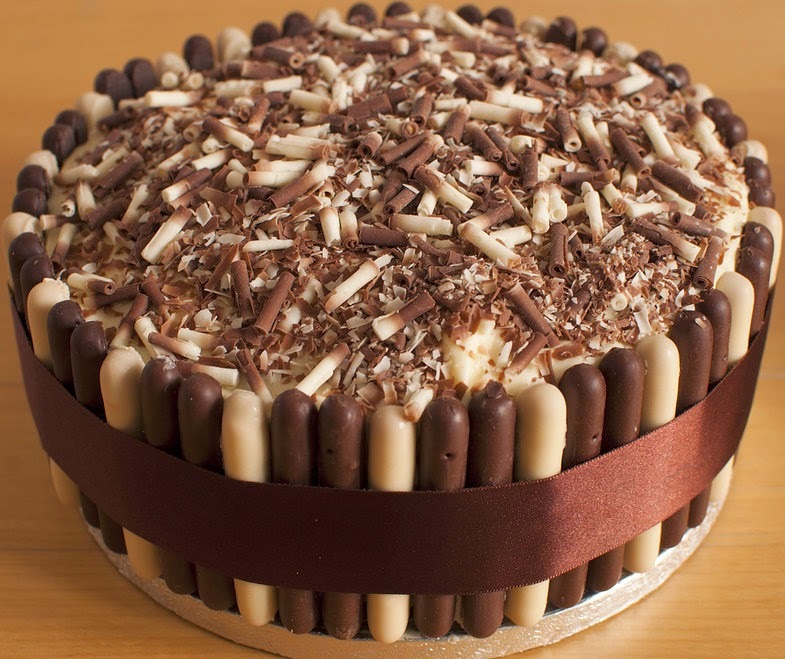 The following day was dedicated fully for the chocolate show. I arrived the time the show was opened and I didn't regret it. As the first hour and half the big crowds that are typical to the show weren't present. The show was spread over 2 floors. 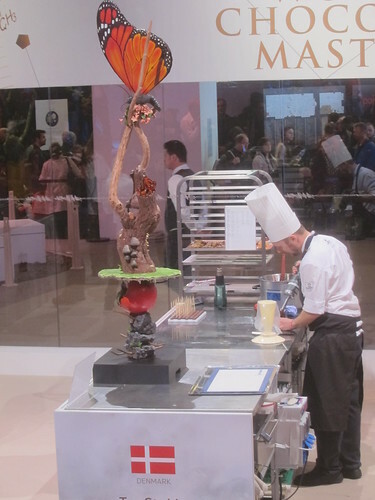 In the lower level there was a small section for professionals who would like to find out about the latest machinery to make the next best chocolate, the countries booths and the area of the patisseries challenge. 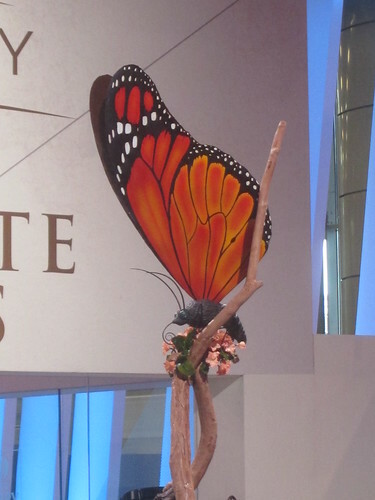 The top floor was mainly the chocolatiers selling the merchandises and the stage for the fashion show. There are a few things that caught my eye in the show. The present of so many Japanese chocolatiers. I count and there were 10. If it's not enough some of the French chocolatiers hired Japanese to work at their stalls. 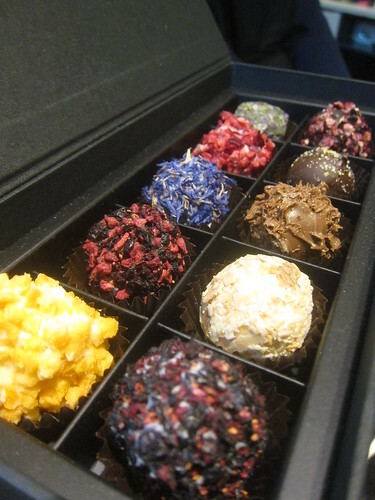 Chocolate shop from Hakata in Fukuoka Japan produce those chocolate truffles that are sweeten by sweet potato. 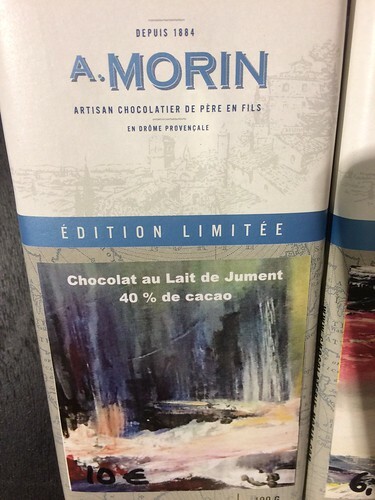 A Morin chocolate produce horse milk chocolate. 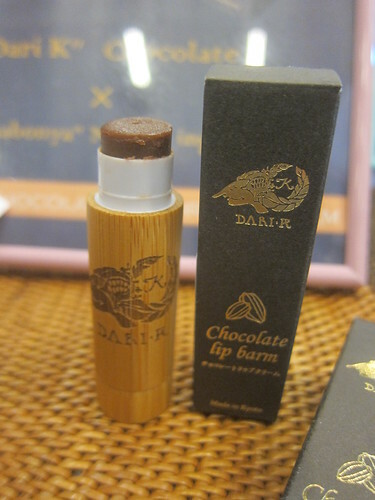 Dari K sells lip balm made of chocolate. You can eat of course. Un Dimanche à Paris and had their special chocolate brunch. The special brunch menu isn't cheap, but worth the money if you want to try food infuse with chocolate or even if you simply love food. 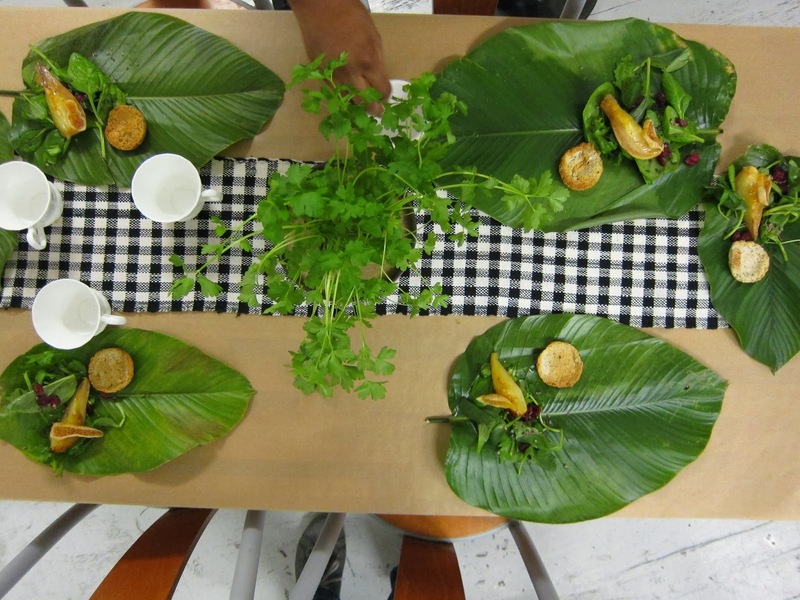 The meal doesn't have only sweet plates as you can't find in the photo, but also savoury plate. I think the only non chocolate food was my glass of orange juice. 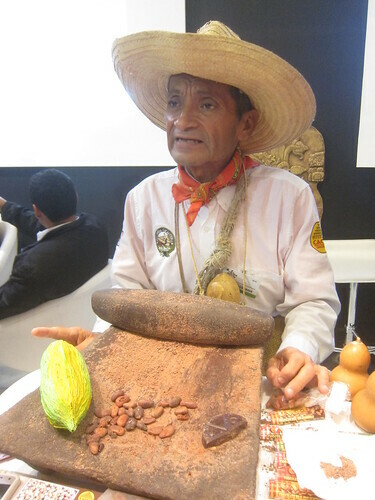 I thought about exploring more the chocolate with food and talking with the bloker of El mundo del chocolate blog. 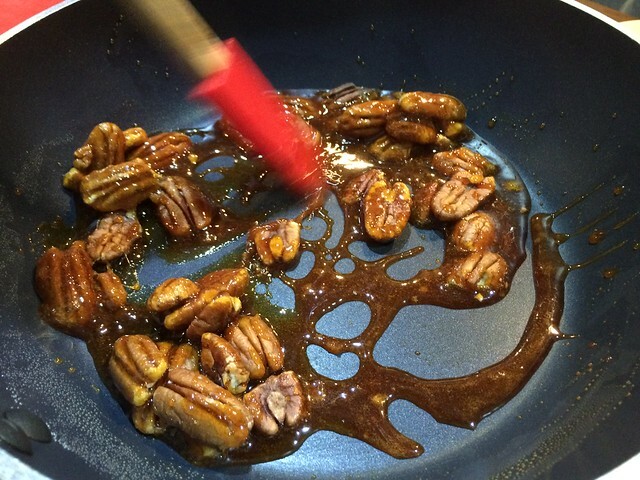 I got a recipe for squid in cacao sauce. I got a comment from a vegetarian friend about the colour, but I think it's more because she's anti anything which contains fish or meat as I fed that dish to some chocolate experts a couple of weeks ago and they enjoyed it, but a comment I got that it'll be easier to accept a chicken dish rather than something exotic like squid for people in London. 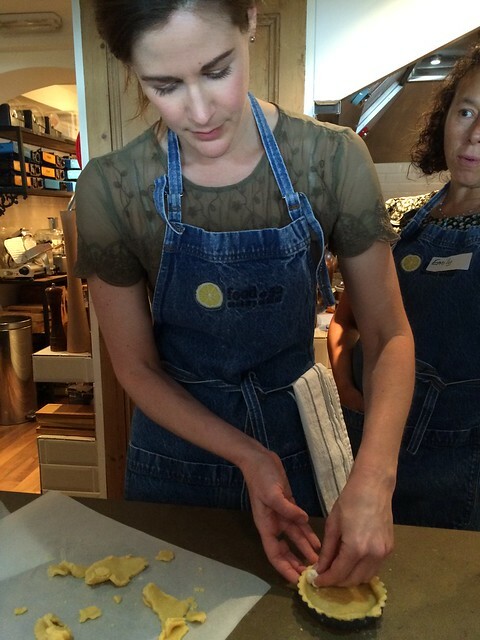 Last week I had the privilege to attend a chocolate cooking class run by Annamarie Jones at Food at 52 kitchen. It's my second class with Annamarie. 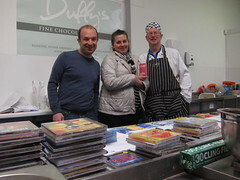 The first one was just before Easter which was a Easter chocolate class at Bake with Maria. Back to the class at Food at 52. They got an attractive kitchen is the heart of Clerkenwell. 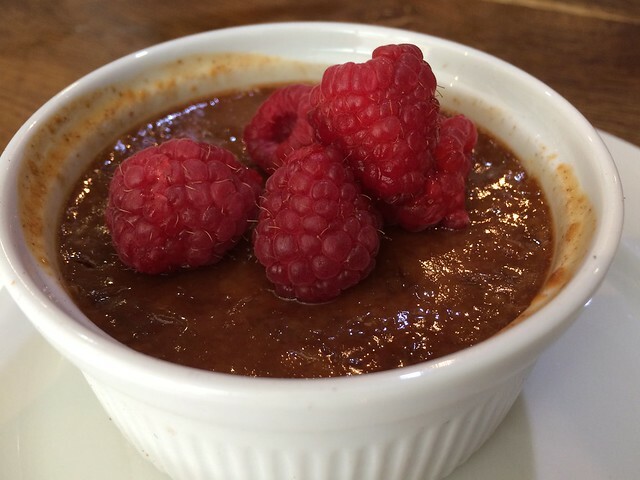 We prepared Chocolate Oaxacan mole as the main course. For the one who are curious what it contains. 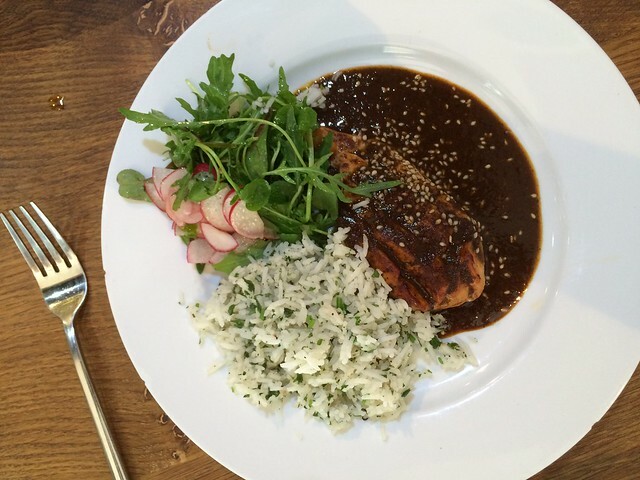 It's a chicken breast in a mole which is a Mexican sauce with chocolate with accompaniment of coriander rice after finishing the main we had the Milk chocolate pots de creme. 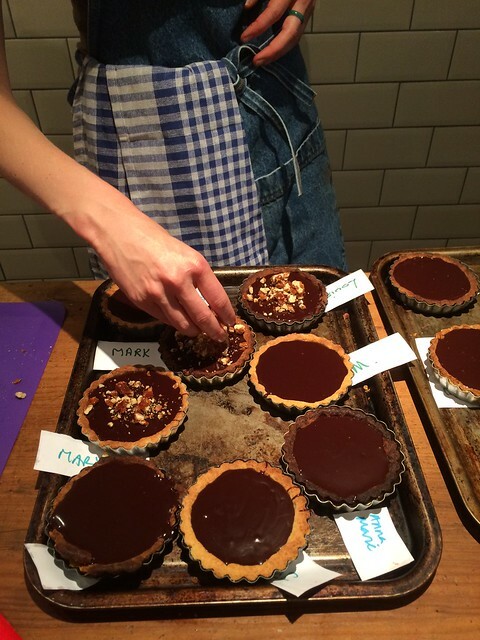 At that point we were stuffed so the friendly team at Food at 52 packed for us to take home the Sea salted dark chocolate and caramelised pecan tarts and the Milk chocolate mint and lemon truffles. 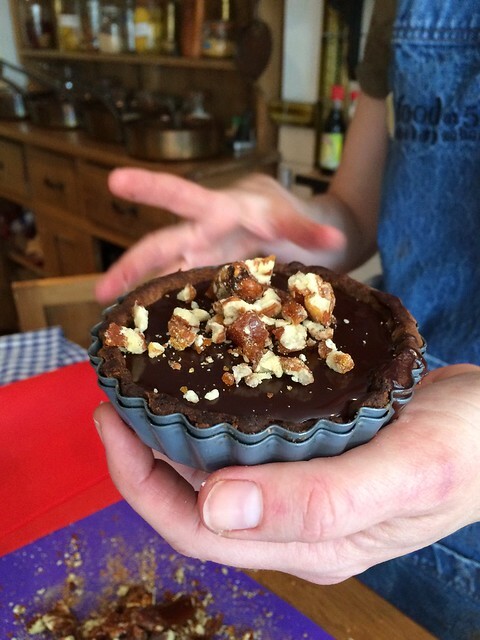 I first met Annamarie when she worked in the kitchen of Melt chocolate shop in Ledbury Street. 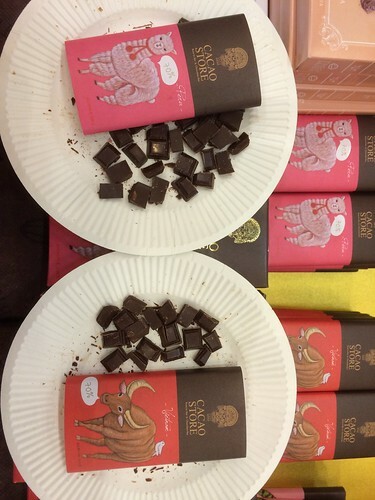 I took a group on a chocolate tour in Notting Hill and she did a short chocolate tasting for us. She made her way organising events for Rococo chocolate and now one of her jobs is teaching people how to make chocolate. 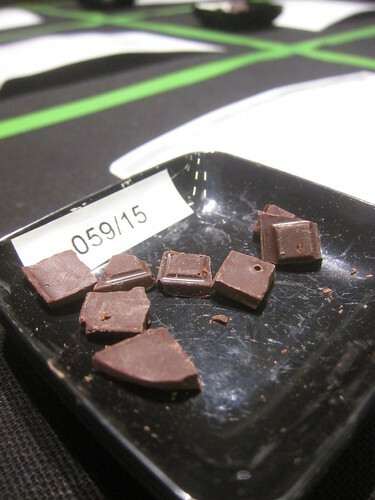 The day I spent in this class left me want to explore more about food infused with chocolate. Hopefully there will be a follow up class somewhere. I have been busy last year with my job and nothing has been posted for quite a while. I have been to the usual stuff in London. 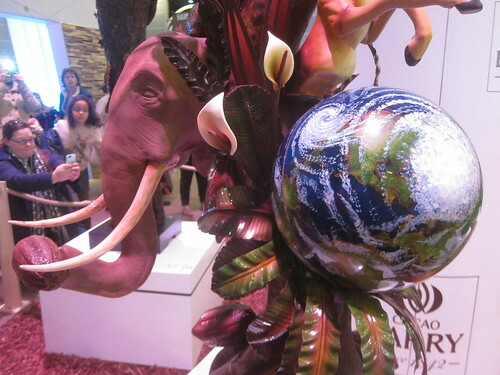 The Chocolate Show and Chocolate Festival, but a visit to the Salon du Chocolat in Paris was the preparation of my Christmas holiday. I had in mind to visit Madagascar which I always wanted to visit. Back in 2005 I bought a book about this island, but after checking the weather like during Christmas I decided to abandon this idea and head to South East Asia. Paris was the second time I met Vincent and Samuel from Marou Chocolate and when I told them about my plan they invited me to visit their factory in Ho Chi Minh City. I also met Arnaud from Erithaj Chocolat. For most nationalities you need to obtain the Vietnamese visa in advance. It's quite easy to get it online, but if you want a multi entry one you have to use the services of the embassy. I needed to get few extra vaccinations and I bought the Malaria tablets as advised by my surgery which wasn't necessary where I travelled in that season. The north of Vietnam doesn't have the right climate to grow cacao as I learnt and indeed it was too cold in December what would kill the trees if they were planted in this area. It's only from the centre of Vietnam heading south that you can find the cacao trees. Just before heading back to London I visited first in Ho Chi Minh city (Saigon) Marou Chocolate. The factory is located outside the tourists area where I stayed. Saigon is split into several districts and it was about half hour drive to reach the factory in a small industrial estate in a middle of residential area. The entrance is where the beans are stored in bags and that area where the roasting machine is located isn't temperature controlled. 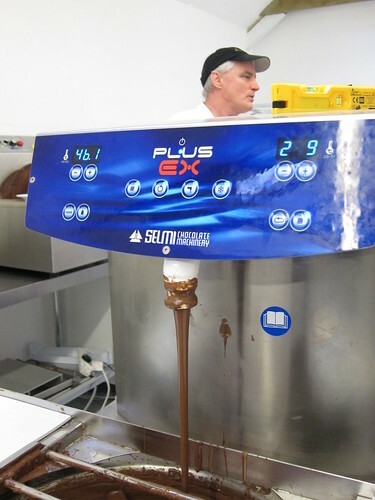 The next rooms where the conching & refining, tempering, packing and storing the chocolate is done in air conditioned area. 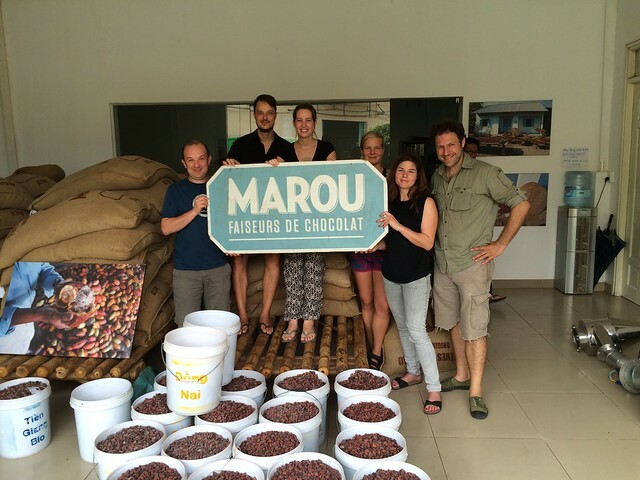 Marou sources their beans in Vietnam from different regions. 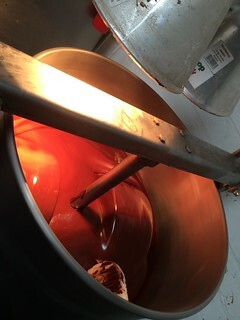 The climate and the soil change from region to region what gives the end product (our chocolate bar) different flavour. In the afternoon I visited in the downtown Puratos Grand-Place. 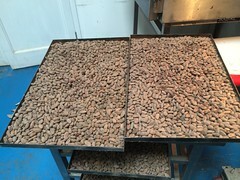 They export Vietnamese cacao beans. It was interesting to listen to their presentation and to learn more about the cacao in Vietnam. 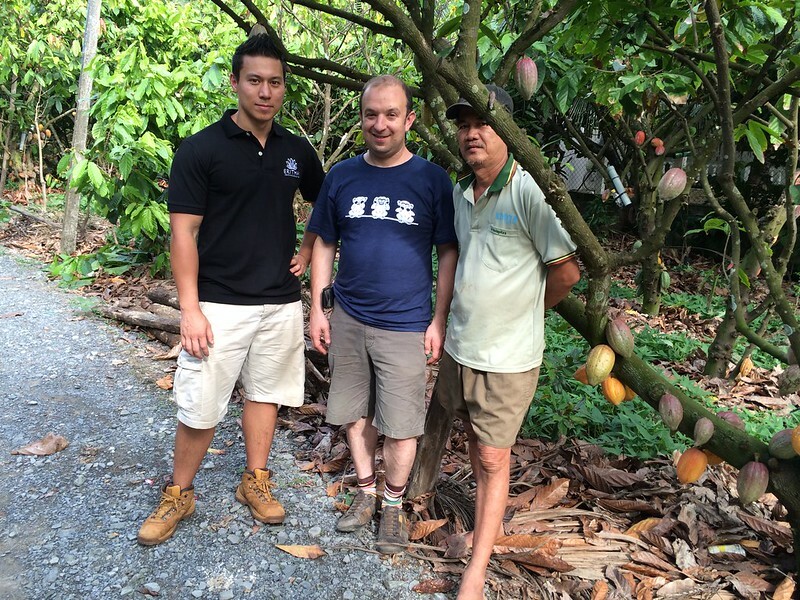 i learnt they are part of an European enterprise and although the cacao is collected and fermented in Vietnam. It's transformed to the end product in Malaysia if I remember correctly. 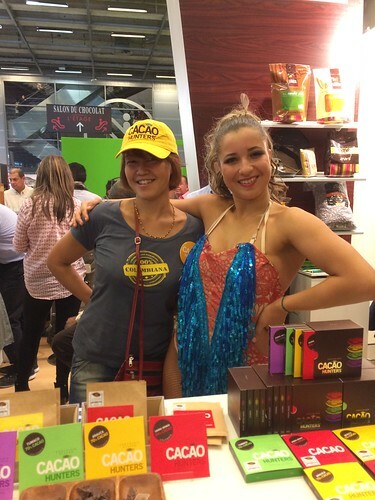 The cacao world in Vietnam is still in a virgin stage. I tried to organise with to visit the fermentation factory, but as I had to leave in a couple of days back home they didn't manage to arrange someone to go with me, but they gave me sample of beans and chocolate of a high quality. The following day was my last day in Vietnam and I took the bus to Bến Tre which is located on the Mekong Delta just over 2 hours on the bus away. I met Arnaud from Erithaj and we went to visit his fermentation place. It's located in the yard of an old school and what is interesting that probably most people who pass by don't even imagine what happens behind the fence. 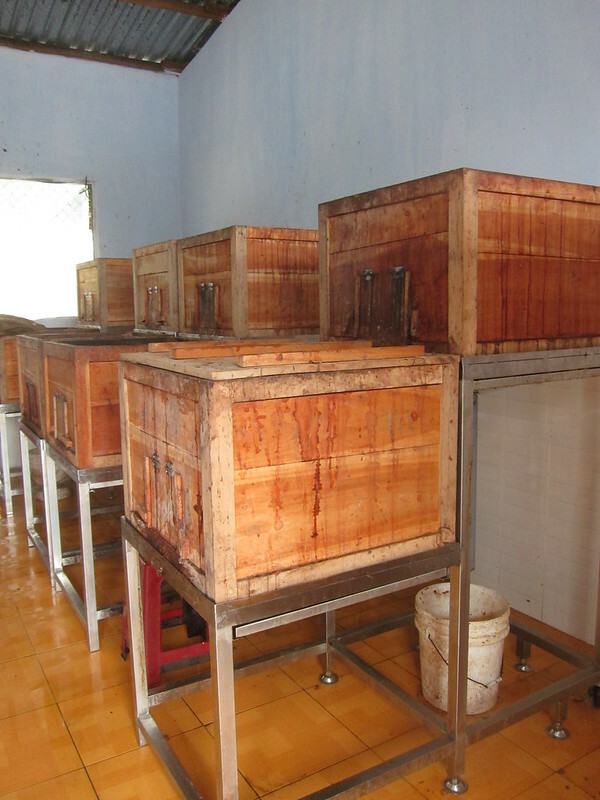 The process starts by opening the cacao pods and pouring the content into the fermentation boxes that are kept in what used to be a classroom. After about a week the beans are moved to the yard to be dried. If it's rainy there are a few local guys that help Arnaud and cover it with plastic sheets. After a lunch in a local restaurant we went to visit the farmer. In Vietnam you can find forastero cacao trees. There are different varieties of trinitario and it's still experimented by people from the university to find which variety would yield the best results. I was told there is a professor from the local university that supervise that process. Arnaud makes the fermentation process in Vietnam and then export the beans to France. 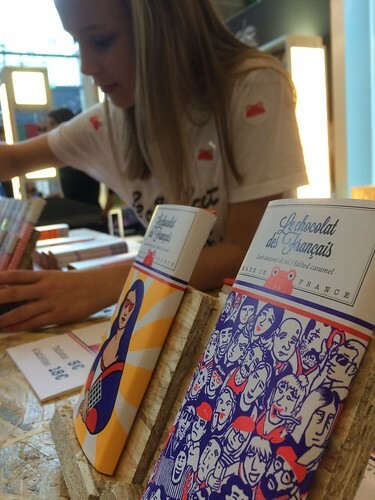 In France Erithaj makes chocolate bars from their Vietnamese cacao beans. That was the reaction of most people I spoke before I travelled to Wales a month ago and for me it was also a self discovery tour of what Wales offers in the food arena. It all started about a year ago. I met in one of the food fairs in London the lovely couple Nick and Kitty and talking about chocolate they told me about the Taste Trail, which I decided to try. I packed a small bag on a mild mid week morning and together with a friend headed north west. The drive in England is on motorways, but when we reached Shrewsbury (still in England) which was our first stop, the roads become narrower and quite often we were stuck behind a slow truck. Shrewsbury is very pleasent and walking on the high street toward the castle we discovered the first chocolate shop of this journey The Chocolate Gourmet. They stock some good quality chocolate bars, but the truffles are all imported from Belgium as I expected to find some local chocolate. The best option if you want to try local chocolate is to head to the market where Julia from Toot Sweets Chocolate sell her stuff. 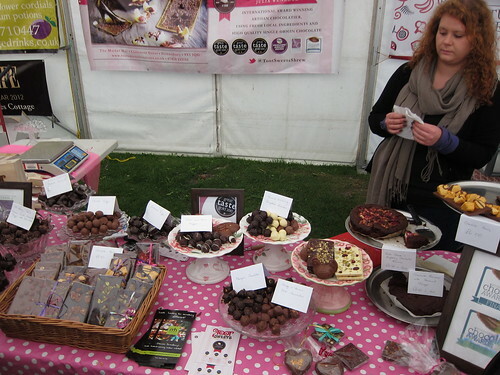 I tried her awesome chocolate in Ludlow Food Festival a few months earlier. Leaving England behind and entering the unknown territory of Wales. Even if you miss the sign Welcome to Wales you noticed straight away on the narrow roads the Slow writing on the road is replaced by the Welsh equivalent of Araf. It took us another couple of hours to get to our first chocolate stop in Wales. Visiting Nick and Kitty from Chocolate Fusion. The weeks before our visit brought a lot of rainfall to Britain, which caused to the roads to be flooded. I set my SatNav App to the given postcode and had the instruction was given by Kitty, but due to the storms the sign fell off and only passing by the house the second time we realised we are in the right place, but be aware the mobile signal in this area is quite poor, not talking about 3G, but I'm talking about 2G. Nick and Kitty bought a farm house in a small village and on the same plot got their workshop. They confer the barn into the existing chocolate factory and told us they work on building a visitor centre. 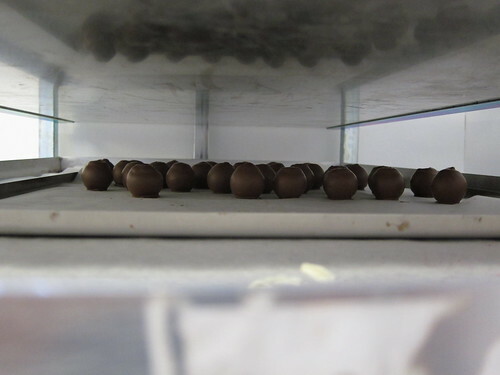 We were welcome into the factory kitchen and been served with the latest truffles they were working on. 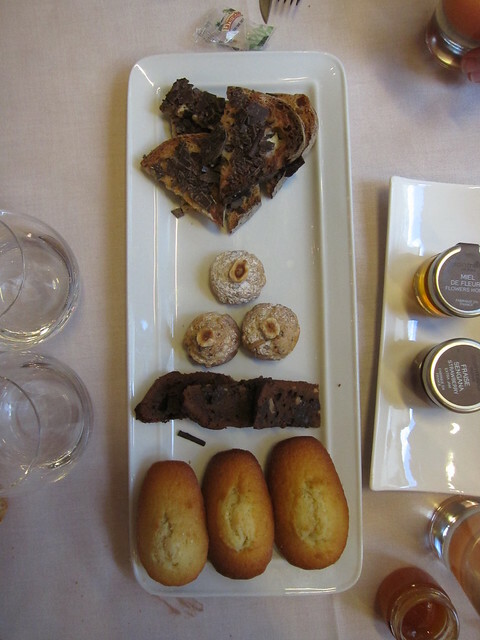 There were few versions of each truffle experimenting with the flavours. We tasted the Blackcurrent marshmallow coated Ecuadorian chocolate, Chili cinnamon and cardamon and Banana spices rum and caramel. 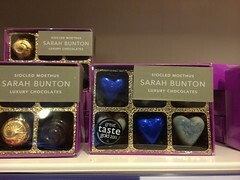 The next chocolate place in our list was Sarah Bunton Chocolate. Situated in Y Caban, Devils Bridge. The home of the Devils Bridge Falls is a couple of minutes by foot and the last stop for the steam train from Aberystwyth. Consuming so much sugar made me crave for some savoury food, so the next 2 stops we visited cheese farms. 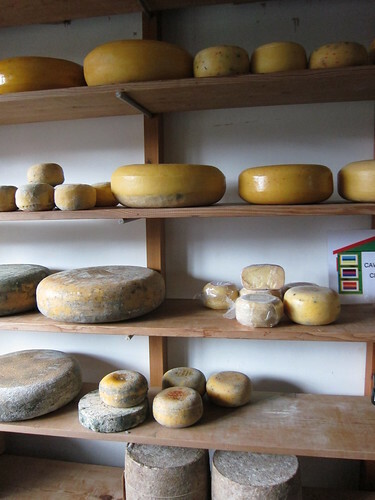 The first one was Caws Teifi Cheese that also produce spirits by Dà Mhìle Distillery in the same farm. The second is Caws Cenarth Cheese. Both farms produce tasty cheese. Small selection can be purchased in top delis and department stores in London. We spent the nights in a lovely B&B by the name Ffynnon Cadno and run by the couple John and Jill. The house is on the A44 road just outside Aberystwyth. This place is highly recommended. Jill works at Y Caban making chocolate she can tell you some secrets about making chocolate. 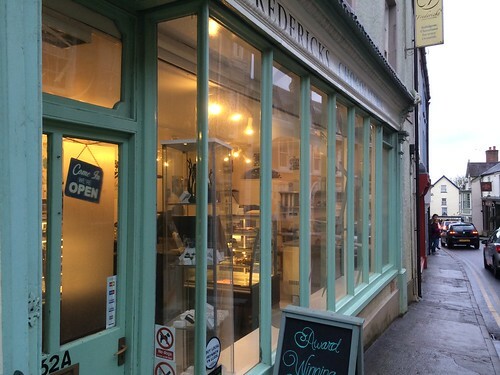 Heading back to London we passed by No 14 Chocolate House in Fishguard, but due to renovation the shop was closed and the last stop was at Fredericks Chocolaterie in Narberth with their delicious truffles. A short drive east of Narberth will bring you back to the motorway. Another gem I visited another time is the Black Mountain Gold Chocolate in the pretty town of Crickhowell. I haven't been here for over a year, but the town and the chocolate shop worth a detour of the M4.